When you bought the original ipad2 Smart Cover, it can only protect the Front Screen. 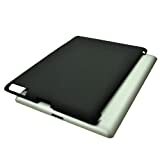 This Hard PU Case can be used together with original ipad2 case, which is designed for protecting the back of your ipad2. It is better than normal TPU Soft Case, it can tightly attached with ipad2 and smart cover.